In 1912 Samuel South(1) purchased a house and land at Devonshire Hill Lane (formerly Clay Hill). 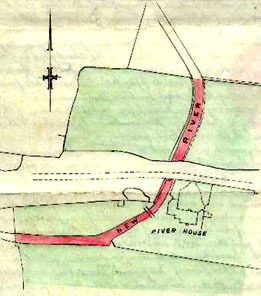 A section of the Tottenham loop of the New River passed through the grounds of River House. The loop had been abandoned in 1852 following the construction of the tunnel between Middleton Road and Wightman Road. The 1912 conveyance did not include the bed of the New River and was purchased by Samuel(1) for £10 by an indenture of 26 March 1915. The plan below is incorporated on the document.